When most museums and galleries think about being listed on the web they immediately think about getting a website. These days most web searches for a business never make it past the initial search results page on Google. 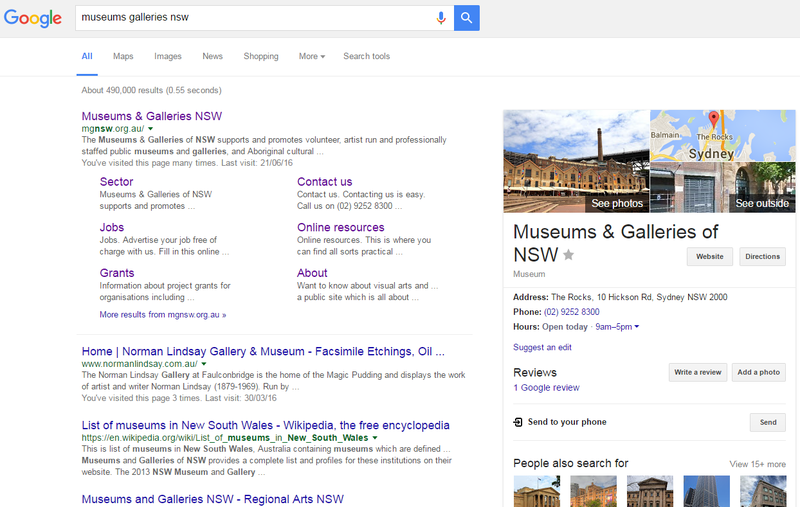 As you will see in the example below on a Google search for ‘Museums & Galleries NSW’ a My Business listing is displayed on the right hand side of the search results. This immediately lists useful information about our organisation , including address, telephone and opening hours. For the majority of search enquiries this information is sufficient and therefore there is no need for the user to click through to our website. The search results on a smart phone allow the user to immediately call or get directions with one click. When Google first added this listing feature, traffic to many businesses plummeted, proving that people were getting the basic information they needed. Google My Business complements your existing website by giving your museum or gallery a public identity and presence on Google. The information you provide about your organisation can appear on Google Search, Maps, and Google+. It ensures your business information is accurate and gives insight to how users are interacting with your business or how people are finding you. 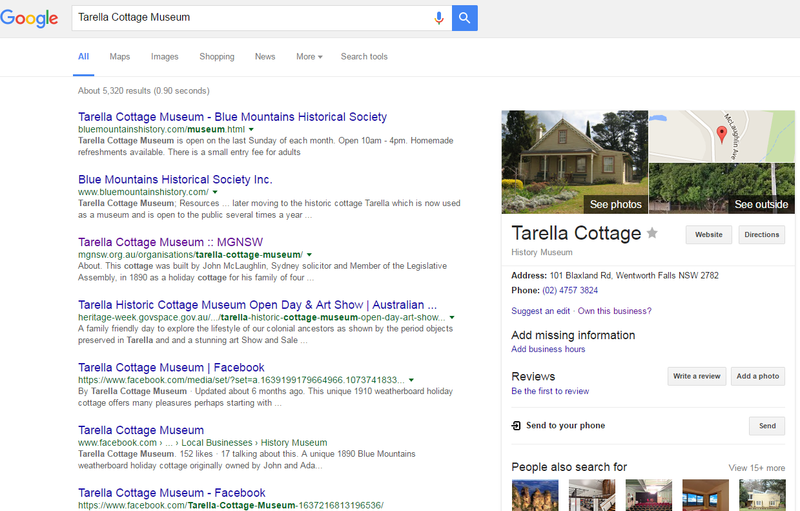 Often Google automatically adds a business listing using information it has harvested from the web, an example can be seen when searching ‘Tarella Cottage Museum’. In this example, no opening hours are listed and there is an option to ‘Own this business?’ If for example you searched your museum or gallery and saw this option, it is now available for you to take control of this listing and ensure the information is correct. Alternatively you can go to the My Business page provided by Google and begin the process of listing your organisation. Before you begin the process, you will need to have a valid Gmail account and be logged in as Google My Business will be linked to it and the verification process is built around it. The following video from Google will walk you through the process of adding your organisation on Google My Business. The verification process helps ensure that your organisations information is accurate and that only you, the organisation administrator or manager, has the access to to make changes to it.